We know, you're sick of hearing about the GDPR. From the hundreds of privacy update emails to the hysteria around ensuring that your eCommerce company is GDPR compliant, we're all ready to put this hefty piece of legislation behind us. Unfortunately, that will probably be easier said than done. Moving forward, companies within the eCommerce industry will always need to keep an eye out to ensure the solutions they work with are GDPR-compliant to avoid daunting fees. Which, while we're on the subject and to mark the "celebration" of the May 25th deadline set out by the EU Parliament, we wanted to send out a quick update with some exciting updates to our solution. The highly sensitive privacy data we process is now handled in clearly separated procedures and will be masked/forgotten when we no longer have a reason to keep this data. Additionally, we do not rely on per-user statistics in our analytics datastore anymore. We store analytics as the aggregations, or summaries, we want to report on. Because of these measures, users don't need to worry about being singled out or identified based on their IP address, simply because we do not have that data stored. We continue to dedicate a significant portion of development effort to improving and hardening our infrastructure security. Data security and storage has always been a crucial element of our business. We make sure we are always on top of the latest and most secure data protection methods. For the full documentation of everything we have done to reach GDPR compliance, please see this document. If you'd like to learn more about how and why we process personal data, click here. 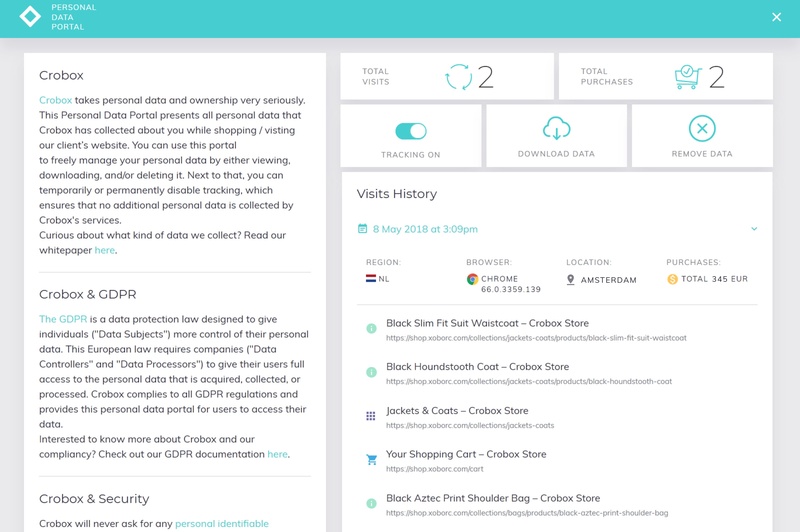 Next to these technical improvements, we've built a User Data Portal for our client's shoppers. Disable/Enable Tracking: Users will be able to turn tracking on and off quickly. Download Data: Data will be available for shoppers to download a copy to their device. Remove Data: Upon request, data will be permanently deleted from our client's database. On our side, the data will be deleted for real-time processing as well as from the reporting analysis database. The portal can be easily implemented onto any platform. We have also built an API for the companies building their own Data Portal that integrates the various third party solutions they use. If you're interested in learning more about Crobox's technology, check out our white paper!